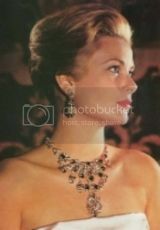 ^There's certainly some romantic attachment to Africa by both princes. They go a lot and there's rarely any appropriate media coverage of it. Maybe it's where they go to be themselves or hide. No clue. Harry goes to two or three of these types of board meetings each year to do with one or other wildlife charity - African Parks is the main one. He usually adds on a visit to such a park which would justify the expense of the trip over a skype session. As this trip, though, is at the request of the FCO there will, no doubt, also be meetings with government leaders which will also mean some sort of talks behind the scenes. When senior royals do overseas tours there is always at least one, if not more than one, government official who is there to talk about business or other issues with the local government but they do so under the radar of the royal visit (why royal visits are described as 'soft diplomacy' because the business side of things isn't the focus of the visit). Harry had an engagement yesterday according to Mio. 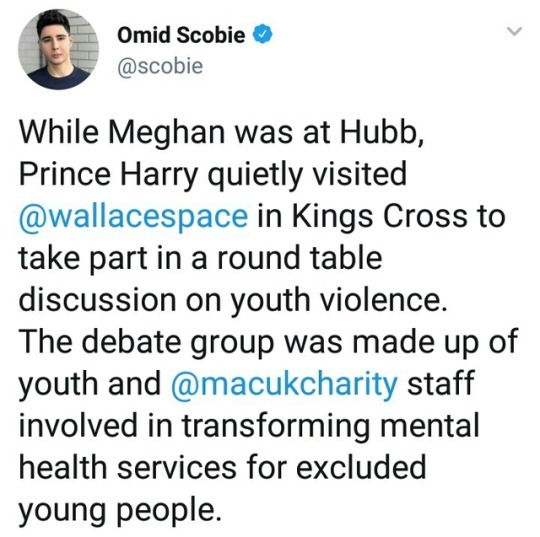 While Meghan was meeting survivors of the Grenfell Tower disaster on Wednesday, Harry held a ‘round table discussion’ with young people from MAC UK. It’s an organisation based in the East End of London that tries to engage with youths who’ve been sucked into gangs or become mired in anti-social activity. Harry is proving as good as his word because he announced in the summer that he planned to target the cause of deadly knife crime. He is using the Royal Foundation, which he heads with Meghan and the Duke and Duchess of Cambridge, to run a project where young people will give their views on the root causes. Such nonsense trying to add her to the engagement. This is a serious issue that needs total focus on solutions; hence the attention seeker was absent. I don't want to sound stereotypist or racist but who in the gun era is doing knife fights? Also, why meet with the victims. Why not work on bringing those knife *fools* to justice. Article on the rising rates of stabbings/knife crime in the UK. The UK has very strict laws on who can get hold of a gun. Knives are easier to access - hence more knife crimes rather than gun crimes in the UK. Sounds horrible. How about tasers and pepper sprays. Aren't they popular at least? I was about to make a joke about who brings a knife at gunfight but if you can't bring a gun for self-defense how do people protect themselves? Prince Harry is set to travel to Zambia on Monday for a two day visit next week on the request of the Foreign Office. The prince will be visiting the British High Commission in Zambia's capital, Lusaka, to honour the UK's long-standing relationship with the southern African country. However, Meghan will not be joining Harry for the overseas trip. Royal expert Richard Fitzswilliams told Express.co.uk: "When Prince Harry goes to Zambia on 26th and 27th November at the request of the Foreign and Commonwealth Office, it will mean he will be apart from Meghan on the anniversary of their engagement. Meghan, who is between four to five months pregnant, might also notably skip a couple of engagements in the next few weeks to come, but will try and complete "as many duties" as she can. 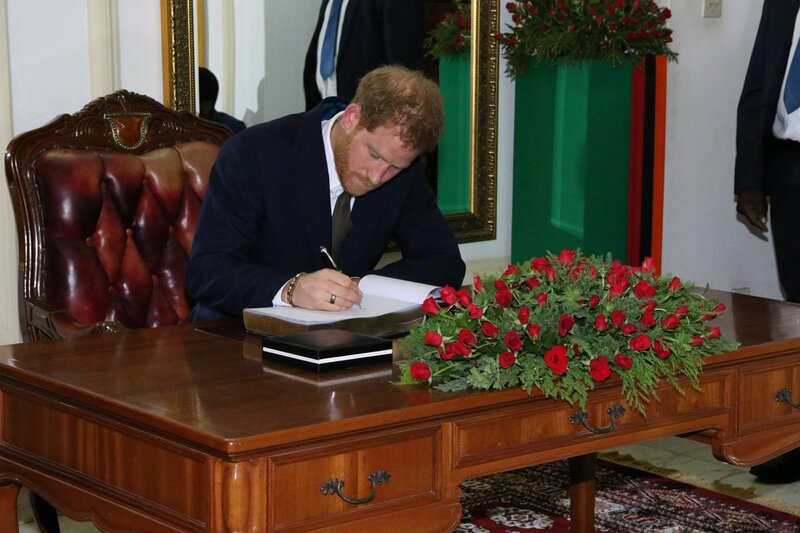 Mr Fitzwilliams added: "Prince Harry’s schedule in Zambia consists of a series of events mostly linked to youth, the military and conservation which are among the causes which he has helped the most. "Meghan will obviously be pacing herself in the months to come but she and Harry have had busy schedules recently and she will undoubtedly do as many duties as she possibly can." Must be nice to be a royal and have their idea of "exhausting." Yep. Harry doesn't want her there. Maybe even the plan is to leave her at Frogmore with mommy while he still lives in the bachelor house in London after the delivery. ^ but much too late now to say doctors told her not to fly. The official announcement from KP was that Harry was to do this two day tour to Zambia alone, as usual at the request of the FO and CO. IMO if it had been intended, ever, that Meghan was to go on this trip then she would have been included in the announcement. To be honest, Harry is not bright or politically savvy enough to be making foreign decisions for that country. If it is a charity event, why did the FO call him in?